There is a gift so simple that it requires no ribbons for wrapping, yet which is so miraculous, it has the power to transform our lives. 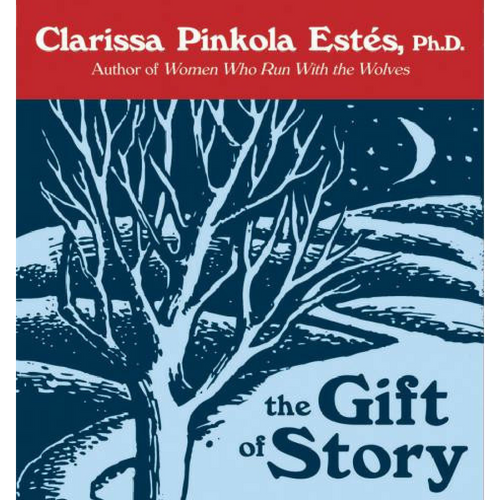 This is The Gift of Story, a tale of love and wisdom from Dr. Clarissa Pinkola Estés, eminent psychoanalyst and author. When an old woman flees to a hut in a lonely forest, begins Dr. Estés, she seeks safety from the savage war that has devastated her village. What sustains her is the greatest of all gifts: a story. One healing tale leads to another, creating stories that each speak eloquently to the question, "What is enough?" Handed down to Dr. Estés by elders within her own foster family, these stories are born of deep suffering; each one pays tribute to the human spirit. Heartwarming and fertile with strong symbols, The Gift of Story is a seed that will bear a rich and lasting fruit within your own family. As Dr. Estés says, "Though none of us will live forever, our stories can. As long as one soul remains who can tell the story, the greater forces of love, mercy, generosity, and strength are continuously called into the world."